If ever there was a community in need of economic development, it's West Englewood. It's riddled with vacant lots. Those that aren't turning to swamps or being used as fly dumps are littered with rubble, broken glass, plastic bottles, and piles of soiled clothes. Since the beginning of 2008, more than 1,300 properties have been foreclosed on here, and countless homes are boarded up, vacant, or clearly occupied by squatters. The roads and sidewalks are crumbling; on the side streets you can hear cars rattling over potholes a block away. On the major thoroughfares, like Damen or 63rd, most of the storefronts still standing are boarded up, gated off, or both—even the liquor stores and churches. At the corner of Damen and 62nd, an abandoned car is parked at an abandoned service station. The city of Chicago has a program to eradicate blight and stimulate new development. 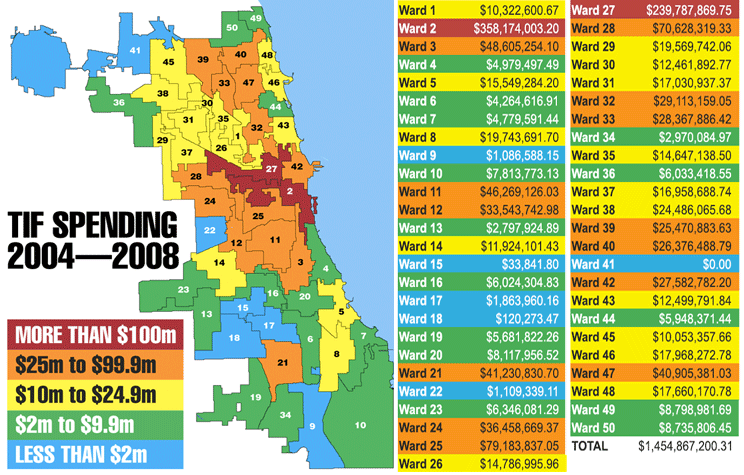 Between 2004 and 2008 it spent about $1.5 billion in property tax dollars on communities Mayor Daley and his aides designated as needing a shot in the arm. Yet only about $33,000—or 0.002 percent of that $1.5 billion—went to the 15th Ward, which includes most of West Englewood. It ranks 49th out of 50 wards on the list of communities receiving those funds, just ahead of the middle-class 41st Ward on the northwest side. The 41st Ward didn't get any of that money because its longtime alderman, Brian Doherty, is opposed to the program. But the other wards not receiving much in the way of TIF funds include depressed communities such as Ashburn, Roseland, Little Village, Auburn-Gresham, and West Pullman. On the other end of the spectrum are the three wards that encompass downtown Chicago. They shared roughly $626 million of that $1.5 billion, or about 43 percent. We're of course talking about Chicago's tax increment financing program, which collects more than $500 million a year. Unlike funds collected through property taxes and distributed through a public budgeting process, TIF money goes into special funds controlled by the mayor and distributed with minimal public oversight. By law the program is supposed to help blighted areas that wouldn't attract sufficient economic development "without the benefits of tax increment financing"—that is, areas that won't improve unless the city ponies up to get rid of "dilapidation," vacant buildings, and environmental problems and bolster infrastructure. Mayor Daley, its biggest proponent, has long claimed it's done just that. "Most of [the TIF money] is pledged for economic development in depressed areas, to bring jobs back or keep jobs there," he told Chicago Public Radio last fall. But it's clear that the money is not reaching many of the neighborhoods that need it the most. We've been writing about abuses of this flawed program for years, so we knew it was bad. But until now even we didn't know it was this bad. Through a Freedom of Information Act request, we recently acquired records from the city showing exactly how TIF money was spent in all 156 TIF districts that existed from 2004 through 2008—information never before released to the public. We asked for the expenditures broken down by ward, but city officials told us they only kept the information by district and didn't have any way of knowing exactly what TIF-funded projects were in which wards. Instead, they provided a set of formulas showing the portion of each district in each ward. So we conducted an analysis to get a sound estimate of where the money's going, applying the city's formulas to the district totals. For example: $1,548,011 was spent in the Bronzeville TIF district during this period. Portions of the district are in three wards: the Second (24 percent), the Third (53 percent), and the Fourth (23 percent). That works out to about $371,523 going to the Second Ward, $820,446 going to the Third, and $356,042 going to the Fourth. It's probable that the money wasn't distributed in this exact proportion, but the city said that's the best it can do. Our analysis shows that the program has become one of the chief ways the city pays for basic infrastructure improvements and repairs such as new el stations, greenery, street paving, wheelchair-accessible sidewalks, and ornamental street lamps. But only in select wards. In fact, it's not just poor areas that are skipped over. Middle-class neighborhoods, including Chatham, Beverly, Rogers Park, and Lakeview, don't get much investment from the TIF program either. Portions of the Second, 27th, and 42nd wards are in fact struggling economically—but those areas are largely missing out too. Some aren't covered by TIF districts; in other places the TIF districts aren't collecting much money. For example, the 27th Ward reaches into parts of Garfield Park where the landscape is dominated by empty factories and vacant lots, but little TIF money has been spent there. While the City Council has the authority to correct these disparities in spending, it's not using it, either because the aldermen lack the will to battle Mayor Daley, who controls the purse strings, or because they don't understand the program. Alderman Toni Foulkes, who represents the 15th Ward, says she's asked city officials to help her get more resources into her community. But she was just elected three years ago and says she's still figuring out how TIFs work. "It's a pretty tough system to navigate," she says. "You don't walk in and know everything." Anthony Beale has been alderman of the Ninth Ward, which includes Roseland, since 1999, but he says he's not concerned that his ward only got roughly $1 million in TIF money from 2004 to 2008, ranking 47th out of 50. "It takes a while to get a TIF going, especially in a struggling community," he says. But Alderman Robert Fioretti, whose Second Ward was the biggest winner, is almost sheepish about the disparity. "I didn't create the TIF program," says Fioretti, who was also elected in 2007. "TIFs were around long before I got into office." There are two good reasons that much of the money intended for poor wards is spent in wealthy ones. One has to do with how the program's designed, the other with how it's used. The TIF program works by freezing, usually for up to 24 years, the amount of property taxes that the schools, parks, county, and other governmental bodies can collect in a designated area. That's the TIF district. If property values there rise, producing higher tax revenues, the extra funds go into a TIF account. The money in that account is supposed to be spent in that district, though it can also be transferred to an adjacent TIF district through a process called porting. Seventeenth Ward alderman David Moore was hazed with one of the oldest tricks in the Chicago book: stealing a rookie's TIF money. Who wins and loses in Rahm's TIF game? Under Mayor Emanuel, most economic development funds are spent downtown while neighborhood investments lag behind. If columnists keep pushing the mayor's line on TIFs, that leaves Mayor Rahm free to keep using the $400 million-a-year program as his slush fund. Some claims by Fioretti, Garcia, and Wilson are questionable, and so are Mayor Emanuel's claims about them. Mayor Emanuel sits on an estimated $1.7 billion in TIF reserves. The clerk proposes a TIF fix. Our aldermen (at least a few of them) finally challenge the mayor on TIFs! Most of the City Council still wimps out, but it's a start. The city levels a swath of the south-side community to make way for a rail yard. Keith Koeneman's new biography, First Son, details Daley's accomplishments—but it barely sets foot in the city he reigned over. The jugglers and the clowns do their ward map thing! The Englewood TIF coughs up $3 million to help bridge Chicago's budget gap. Chicago's tax increment financing program money isn't reaching many of the neediest parts of the city. In fact, Chicago's economic disparities may even be widened by the program. Here are some images from neighborhoods that have benefited from the program—and from those that have missed out. 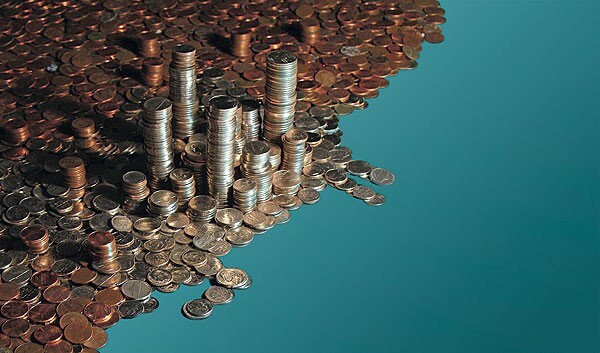 The City Releases the "Shadow Budget"
The Reader acquires a copy of the city's proposed tax increment financing budget. Ben Joravsky's first article on the first TIF district, back in 1987, predicted the problems with the program from the start. The quest to fire Ogden International’s leader exposes flaws in the disciplinary mechanism.